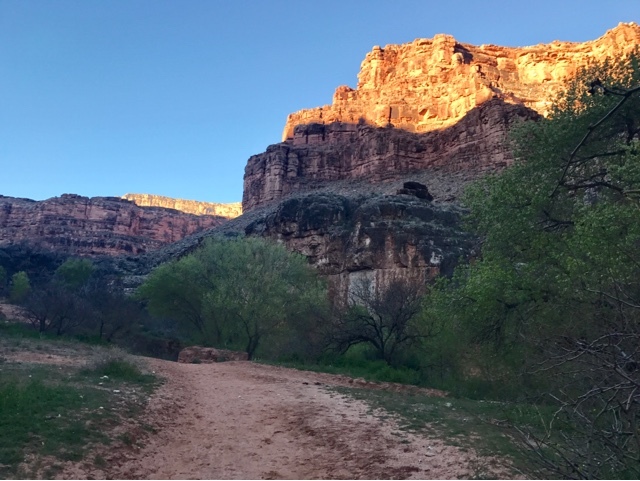 Our day out of Havasu Canyon was an early rise. Up about 1 hour before sunrise and starting to break camp so we could get an early start as it will be a long day hike out. We previously planned to take our time and make a number of stops along the way. One of the stops would be to make breakfast when the sun was over the rim of the canyon so we could enjoy the warmth. It was in the high 30's this morning. 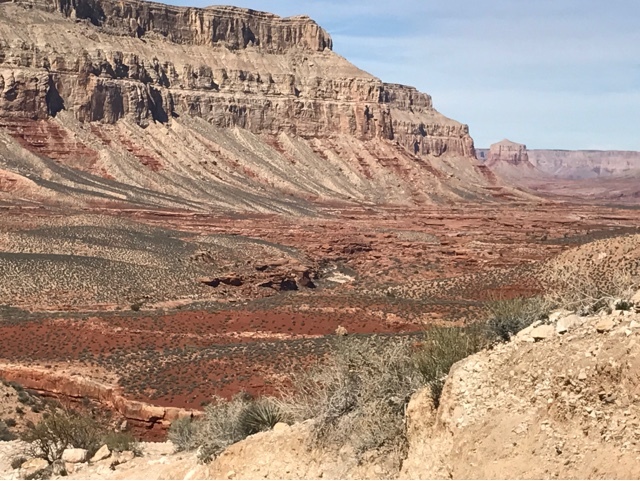 As we climbed out of the campground past Havasu Falls we stopped for selfies and our last look before heading out. The amount of sun you get during the day in the canyon is relatively small. 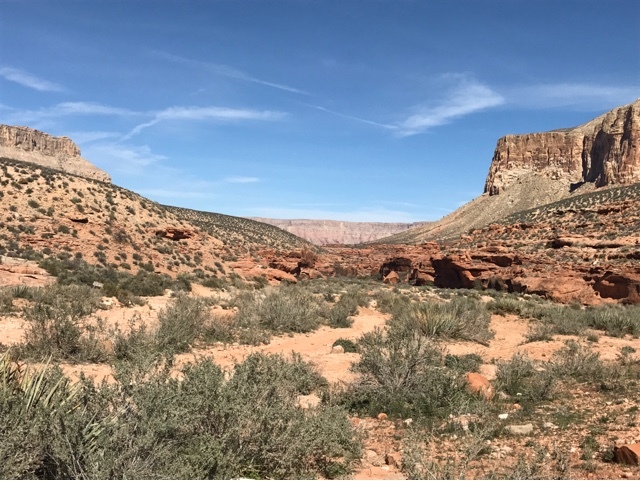 It is possible to get the most sun by hiking to the Supai Village as it sits in a spot where a number of canyons come together making a nice spot for a village and being able to grow vegetables. 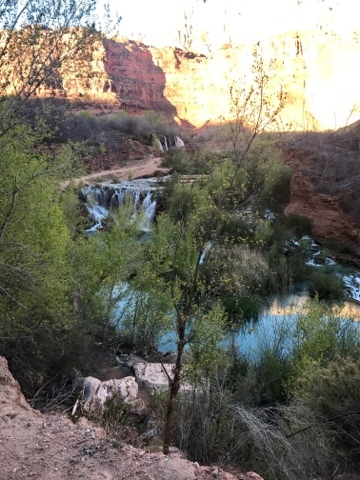 Then our last look at Lower Navajo Falls, area as we climb the appropriate 500 ft elevation and 2 miles into the Supai Village. We were already feeling the elevation gain in our legs as we climbed. 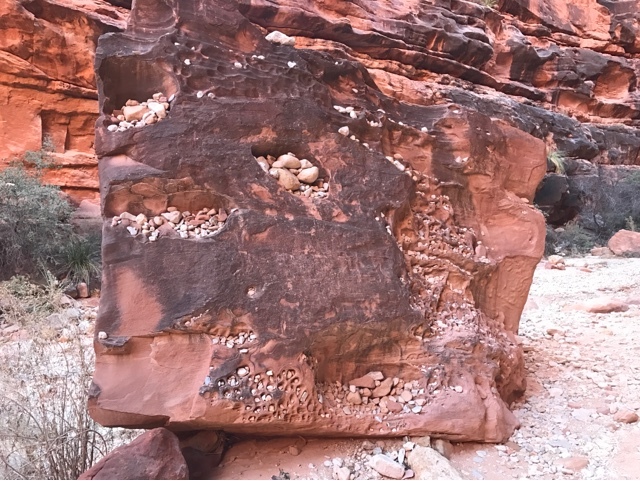 The second day of our hike in the canyon was not restful since we did a lot of hiking that turned out to be yet another 10 miles of going in and past Moony Falls and back up to Navajo Falls for an evening view. Joanne makes the comment to me, Did you realize this was a 3 day hike with 10 mile days for 30 miles? I hadn't thought about it that way, but she was right. I had thought the middle day would be a rest day. It kind of was in that we didn't carry our heavy packs all day. 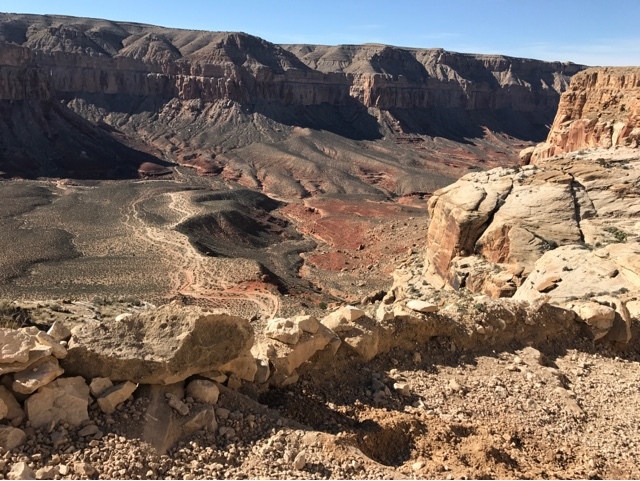 We stopped for breakfast after about the first 4 miles and passing the Havasupai men hand repairing a drainage ditch leading into the village. We took our time eating by Havasu Creek. Rather than carrying all our water from the campground Joanne had suggested we restockbour water here at the Creek. I carried a steri-pen and processed the water as Joanne cooked the freeze dried breakfast for herself and I ate a freeze dried dinner entre. We both felt we had been behind the curve on calorie intake. This wasn't because we didn't have enough food as much as we were just burning off more calories than what we normally took in. 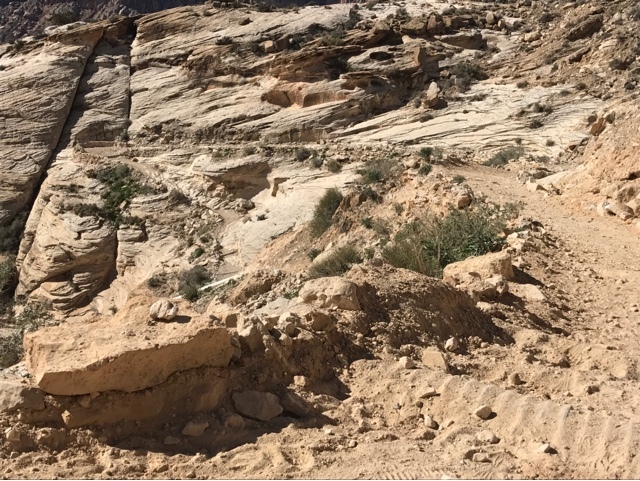 As we made our way up the narrow part of the canyon we met another group of male Havasupai repairing a part of the trail. These repairs are not for hikers but for the mule/horse trains that come through both ways multiple times a day. 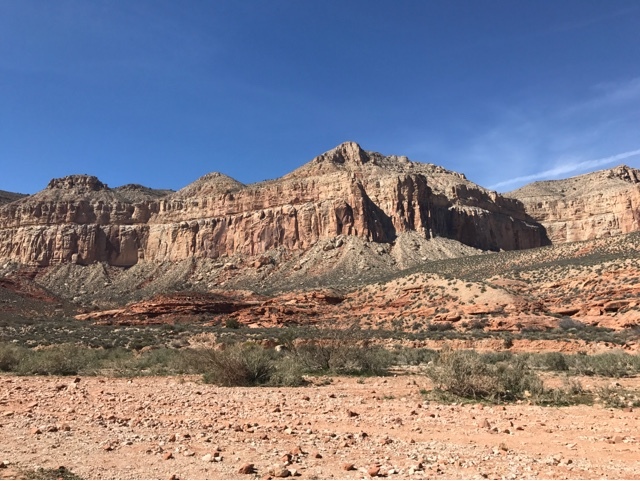 Since Supai it's been a continuous gradual uphill climb. Getting from mile 6 to 5 seemed to take for ever, with a few stops along the way for pictures and just enjoying the scenery. Eventually the canyon opens and you are now in the sun and nothing interested to look at up close. We continued on and to our surprise we made great time through this 2 mile section, although so much of it is on loose sand and gravel that takes extra energy to walk on. 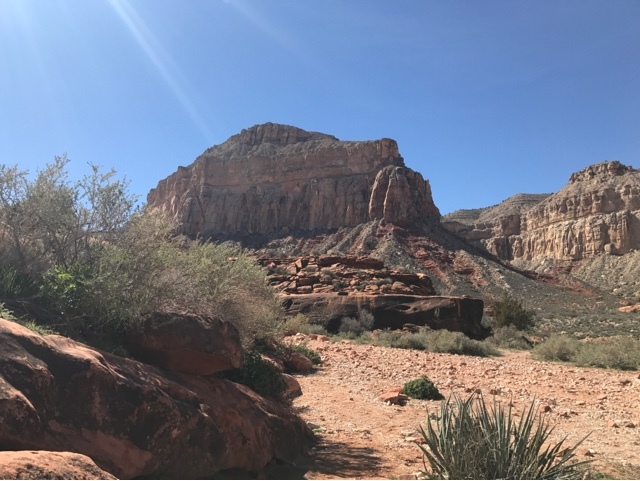 We knew that the last 2 miles of our climb out of the canyon was 1000 feet and that we would be taking the necessary stops along the way to rest. We took our break before the 1000 ft assent after 8 miles of hiking out of the canyon. 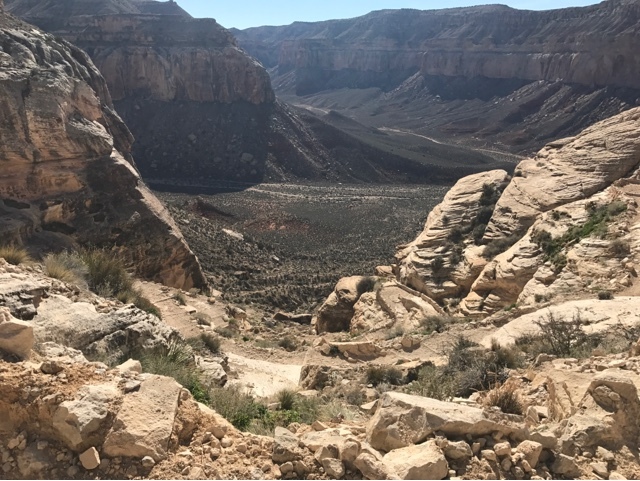 The first part of our assent to the canyon rim went well with both of us having sufficient energy to achieve the above elevation. As it gets steeper we needed to pause and we were glad to let the last mile/horse train of the day pass us up the canton wall. We will need to pause for their decent back into the canyon prior to us achieving our goal. My leg stamina faded the higher up we went, taking more pauses along the way. As I got along the final portion of the climb, I would rest and hike 100 ft or so and my legs faded again quickly. Above, just a couple hundred feet in elevation to go, we get to gaze on the wonderful hike we had been on. At the top we were treated later in with a beautiful sunset. Our hike officially ended about 4:00 pm and we started our hike about 7:30 am. I estimated we would take 7 hours to get out of the canyon. We easily did this as we stopped for breakfast for an hour. 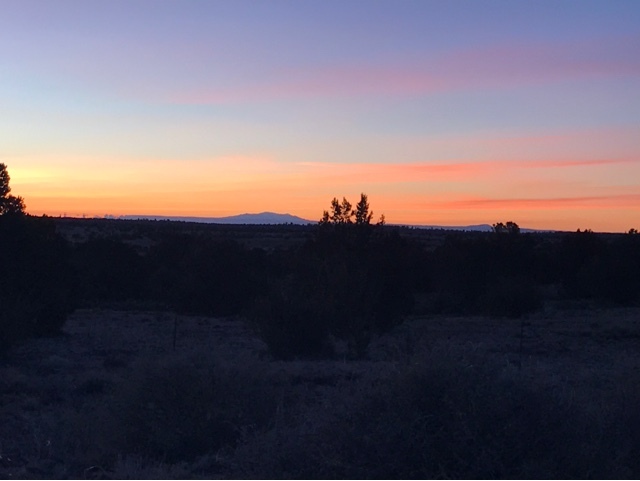 After arriving at the canyon rim we ate dinner and camped for the night choosing not to drive the 3 hours to Flagstaff and arrive in the dark. I will address my training for this hike in a separate post, but I was a bit surprised by my legs fading as I climbed the final 2 miles. In retrospect I had not practiced hiked 30 miles in 3 days with 20 wearing a full backcountry pack. I had also not planned for the extra energy it takes to walk on sand up hill. 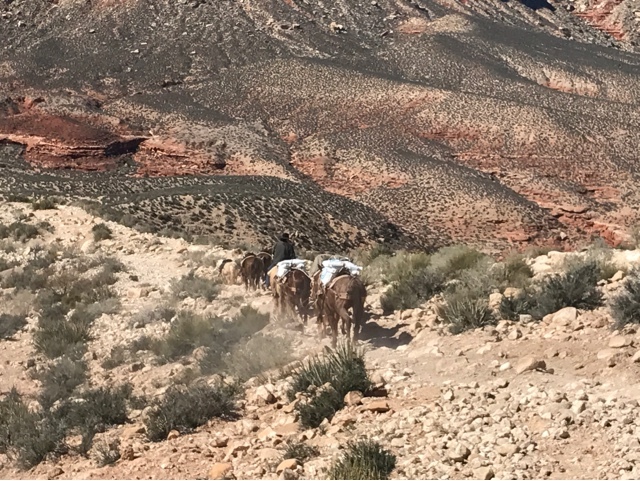 Of all the people I met on the trail I was the oldest with a full pack with others opting to go light and having the mules carry their packs. The average age of those hiking were 20 - 30 years old. I had overcome my heavy breathing practice climbing, but didn't quite overcome my leg muscles needing more practice. In retrospect, I did make it under my own power with a full pack and this was as rewarding as the beautiful light blue water of Havasu Creek and its fantastic waterfalls. 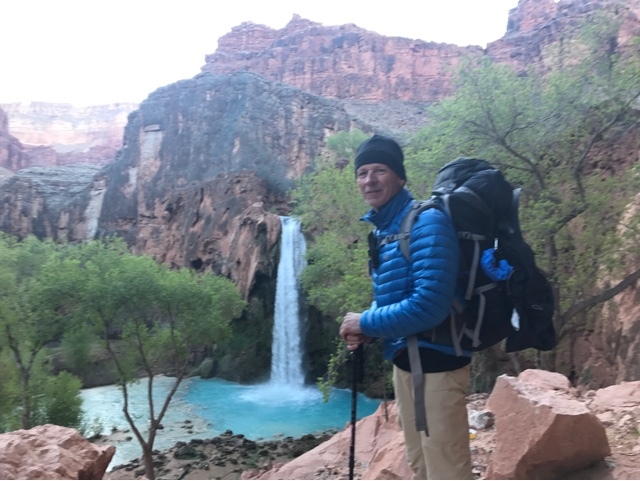 I would say to you that if Havasu Falls is on your bucket list to visit, don't wait until you are too old to do it or enjoy it. I needed to overcome finding the right hiking boots, perpetual sore anckle from an injury years ago, lightweight equipment, apprehension of heights, and age to achieve this hike. Joanne also needed to overcome a number obstacles to make this hike a reality for her too. This made us great hiking partners for this particular adventure. If we could do it you can too. Congratulations Brent, you did it! Good planning and training! Do they take tourists by donkey/ horse down to the bottom and up too, or do they only offer pack ferrying? I'm so happy I got to go. Yes I saw people getting horse rides out of the canyon but I would guess it would be both ways. You need to reserve pack animals more than 24 hours before your trip in or out.